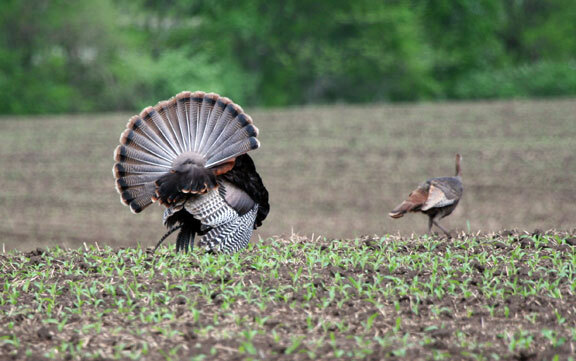 Spring turkey season food at beginning of spring turkey season is more likely cropland sprouts. Bugs later in season. 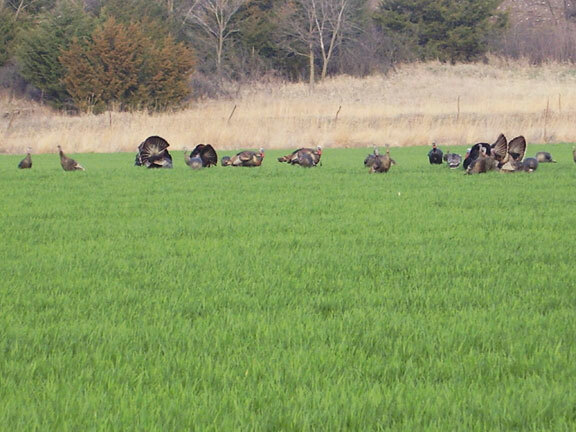 Winter wheat, opening week Kansas archery turkey season, first of April. Milo, late spring season, end of May. General planning is relative to late frost around mid-April. Corn is first of all planted, followed by soybeans as quick there after as possible. Milo must have warm soil around 70 degrees for germination making it more towards a mid May to early June planting. Wheat, all is winter wheat in our area, is a September into October planting. On a later schedule are bugs. They too wait until late frost. Prey bugs such as those that feed on vegetation appear first. Starting in April, reaching higher levels thorough May. By June predator bugs are strong. When scouting an early spring season spot last falls planted wheat is good. Wheat is first to green up attracting grazing behavior. Followed by corn and soybeans which germinate as quick as four days after planting. At right and above is mid season. When spring farmland preparation is under way. 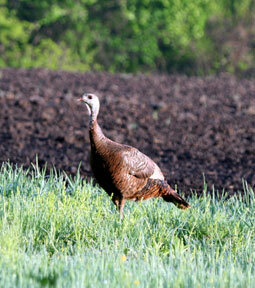 farm equipment in fields has little effect on turkey behavior. They being well conditioned to tractors year round. A farmer stepping off of a tractor is a different matter. Turkeys will leave any spot a farmer walks about, tractor or not. If any field is being worked, without equipment present current to a hunt, hunt it. If equipment shows up come back later. 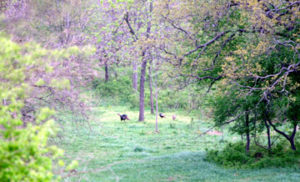 Turkeys will continue to use that field. At right, last year’s wheat. Shown cut lines in soil surface are from an ammonia soil amendment injection. Right before their hunt. Below. Last week of spring season. Turkey not representative of true flock size, more out of picture. We were standing erect, no camouflage, no concealment, they watched us watch them as they foraged. A hay field. 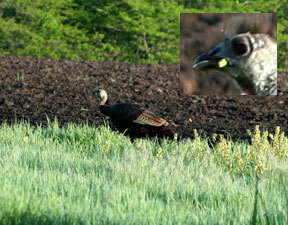 All these picture represent classic turkey habitat. Repeated many times over. In a relatively small area. Giving spring season birds a lot of options of where feed, roost, dust, drink. Make one mistake, even a small one and this is what you get. Behind a tree, gone never to see again. Getting big woods turkey hunters to change his wooded hunting technique to adapt to open ground appears a bridge too far. We can show picture after picture as any of just how open our habitat is with ridge runners will still attempting to run to get a shot. Failure in Run & Gun is open ground allowing toms to see hunters long before hunters can run close enough to get in for a setup. 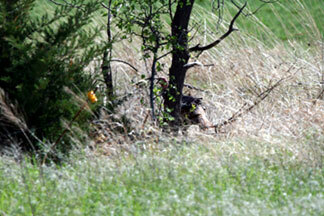 In any case what we offer is spring season turkey hunting. Every hunter be he a run & gun or setup & call hunter may enjoy his hunt as he finds most enjoyable.